Here are some designs you won’t soon forget. 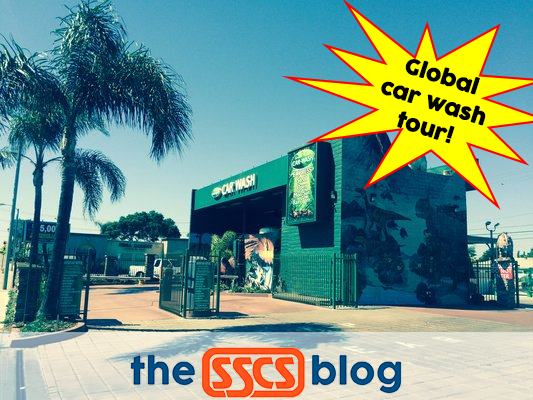 The SSCS Blog has devoted the last two weeks to showcasing the quirkiest gas stations we could find. No doubt influenced by the amount of fun we had writing and putting it together, we were inspired to do something similar for car washes. Car washes are a part of our industry, after all—more than a few gas stations have them. And while we may have cheated a bit by including a few “stand alone” establishments, we’re pretty sure that you won’t mind when you see the results. Even though washing cars may not seem very exciting, nearly a century’s worth of architects and entrepreneurs have endeavored to take the dreariness out of the act by creating fun and memorable environments in which it takes place. These stand in stark contrast to the square, sturdy, bland buildings often associated with the industry: some of these structures are lavish, eye-catching, and often eccentric. A whiff of amusement park kitsch lingers around a few, making them as good as pop culture artifacts. Others…well…you’ll have to see for yourself. Subtlety isn’t a common feature of the billboards and roadside banners in Studio City, California. And yet even in the midst of the garish colors of Ventura Boulevard, Studio City Hand Car Wash stands out with a striking profile, perched as it is amidst restaurants and casting agencies along the south bank of the Los Angeles River. With almost a dozen bays and a constant line of often luxury vehicles waiting for service, this car wash is a testament to how fun and attractive visuals can be used to entice all possible customers. Photo by Cbl62. In the drizzly Netherlands, a very different kind of car wash caters to the needs of Hollanders. In fact, when motorists approach this establishment and pass through its portal, they might get the sense that they’re entering a vintage Star Wars flick. This kind of design is representative of the wide variety of architectural approaches Northern Europeans have applied to gas stations. It may lack the palm trees and outdoor bays of Southern California, but this car wash combines attractive modern design with cleanliness and efficiency. Photo by DV. A small business in Albania takes a very different approach than our first two entries. Located in Albania’s captial, Tirana, this business proves that all you really need for a car wash is water, a hose, and an entrepreneurial spirit. While the handmade signage and ramshackle furnishings out front don’t exactly suggest a multinational corporation, nonetheless, enormous, prosperous businesses often grow from origins that look just like this. And if you ever find yourself in a particularly dirty car in Albania, the Albanian word for car wash, as pictured here, is lavazh. Photo by Gertjan R.
Whoa, stand back! In Tigard, a southwestern suburb of Portland, Oregon, customers can enjoy a nice view while having their car washed. While the lack of an enclosure can induce a double take, this photo shows just how complex these contraptions are, and how much work must go into maintaining and cleaning them—particularly when motorists enter with mud-caked cars. Nowadays, almost all automatic car washes boast enclosures to keep water in and out. But in the notoriously wet weather of Portland, perhaps the idea is to let the rain help do the work! Photo by Visitor7. The sign advertising this business (not pictured) is an adorable plastic octopus with washing implements in each tentacle—a squeegee, sponge, soap, and a big friendly smile. However, the station has a slightly dark secret —it was one of the locations where the television show Breaking Bad was filmed—specifically, A1A car wash scenes. Octopus Car Wash has since benefited from a minor cottage industry of Breaking Bad tourism in Albuquerque, and in addition to letting fans shoot selfies at Walter White’s one-time place of employment, the business continues to clean vehicles as well as it always has. Photo by John Phelan. Well, we’ve reached the half way mark of our car wash tour. Be sure to check back next week for more unique, innovative designs.